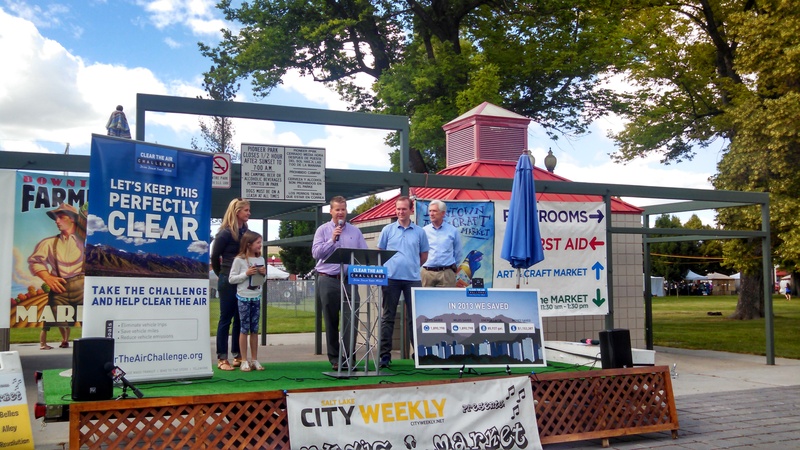 The 2014 Challenge kicked off at the Downtown Farmers Market on Saturday, June 14. Are you ready to help clear the air? The 2014 Clear the Air Challenge starts next week on Tuesday, July 1! The month long Challenge is just that — an excellent way to challenge yourself to “drive down your miles” and reduce your emissions. Choose alternatives to driving alone and track your impact on air quality. The Clear the Air Challenge runs July 1-31, 2014. Register at www.CleartheAirChallenge.org (registration details below). Active transportation (walk, bike) — Biking and walking, also known as active transportation, are gaining popularity as healthy, efficient and sustainable means of transportation. Public transit — To put it simply, ride UTA! Carpool — Carpooling involves more than one person traveling together in a car and can be used for many occasions including commuting to work, attending special events or taking kids to school, practices or recreational activities. This strategy requires some coordination of schedules, but can be easily implemented to achieve significant results. Telework — Teleworking is possible from just about anywhere – from home, a telecenter, the local coffee shop or anywhere that has a wireless Internet connection. Teleworking can include conference calling or video conferencing for meetings instead of driving to an off-site location or working from a remote office. Skip the trip — The skip the trip strategy is as easy as it sounds. Just plan ahead to avoid unnecessary trips. These can be trips taken for work or for home activities. Learn more about these strategies at TravelWise.utah.gov. Join a network, track your impact and compete for great prizes! This year there is a new and greatly improved tracking tool for the Clear the Air Challenge. The new tool will require all users to re-register, but the registration process will only take about 30 seconds and users now have the ability to sign up using their Facebook profile. The Challenge has approximately $10,000 in prizes to give out this year to participants. A number of weekly prizes will be randomly given to people who have earned badges. Grand prizes will be given to the winners in various categories, including: most trips saved, most miles saved and overall champion. The Grand Prize for the overall individual champion will be a $1,300 pair of powder skis provided by Ramp Sports. Social media integration: Sign up with your Facebook account and share Clear the Air Challenge posts to your Timeline. Multiple day trip recording – Forgot to track each time you took the TRAX over the past week? Simply click on each of the days you made the same trip and record them all at once! Trip Planner: Not sure how you might use alternative transportation to get somewhere rather than your car? Simply enter in your starting and ending locations, and you’ll receive carpool, vanpool, transit, walking and biking options to get to your destination. Use this feature all year round whether you are tracking trips or not!